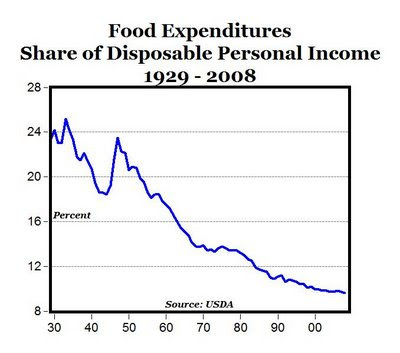 This chart says that Americans spent well more than 20% of their disposable income on food during the 1930s and 1940s. Since then, food costs have plummeted relative to our income--so much so that we now spend just 9.6% of our budgets on food. Now, long-time CK readers know I hate to be faked out by charts that, oh, might be rigged by, say, a biased journalist who massages data to make a point. In order to control for this, please take a look at the source data behind the above chart. You'll be rewarded, because the data gets even more compelling once you explore it a bit further. The USDA breaks down aggregate food expenditures into two categories: food expenditures at home (includes purchases from grocery stores and other retail outlets as well as purchases with food stamps) and food expenditures away from home (includes meals and snacks purchased by families and individuals). Over the past eighty years, the food expenditures at home category declined from 20.3% of income to a paltry 5.6% of income. A decline of this magnitude is quite simply remarkable, especially considering that this is the least discretionary portion of our food spending. Imagine our grandparents and great-grandparents spending almost four times as much of their disposable income on food. Equally intriguing is the food away from home category. This kind of spending is highly discretionary--if we'd like to make meaningful cuts to our food budgets, eliminating a few monthly restaurant meals is the quickest and easiest way to do so. Yet this category of expenditure grew from 3.1% to 4.0% of income. Those numbers may look small, but the key point is this: while our spending on at-home food plummeted, our spending on discretionary away-from-home food increased to nearly half of our overall food spending (4% out of 9.6%). That to me is a staggering insight, and it suggests that we could spend still less--possibly far less--on our overall food budgets by eating out less and eating at home more. Furthermore, this chart doesn't address the massive range of food choices available to consumers now that were unavailable decades ago. Admittedly, some of these choices include fattening and expensive second-order foods, but that doesn't mean we have to buy them. A side note: for a shocking perspective on how insanely wealthy we've become as a society, consider the increase in absolute dollars spent on food away from home: it grew from $2.6 billion in 1929 (a local peak, right before the Depression set in) to $422 billion (!) in 2008. That's a 162x increase. The next time you feel like life is unfair, please have another look at these numbers. All of a sudden, I have a lot more admiration for my grandparents and their era's culture of intelligent thrift. What about the quality of the food consumed? All other things equal? I'm surprised to see, when I did the math, that my percentage is 8.8 for groceries, and 10.3 with food out of the home. I think of these as pretty good numbers! The numbers certainly make a big case for buying more groceries and eating out less to save money and benefit our health. I mean, not to be unscientific, but I really think it's safe to assume that much of that unnecessary out of the home spending on food is on stuff that isn't good for us. Anonymous: Certainly the range of foods available to us has never been greater. I'm not sure how to address quality though. Readers, any thoughts out there? Hi Melissa: you are anticipating a future post I'm hoping to write in the coming weeks! And yes, I agree, meals out of the home are probably likely to be much less healthy than simple foods cooked at home. I have to confess... I didn't think my husband and I ate out all that much, or spent much on convenience foods either. Until I was diagnosed with celiac a month ago and we cut out ALL eating out (from quick sodas at the drivethru to sit down meals at our favorite restaurant) overnight. EVEN with bumping up our weekly grocery budget from $40 to $55 a week (we've already been trying to buy as much local as we can, a lot of bulk, and a FABULOUS local butcher for the meat, but now I've got to add in items that cost a lot more than "normal" food. Example? Even sourcing out to an Asian market rather than the pricey heathfood store, a 5 lb bag of rice flour is $7.89 as opposed to the $1.69 for all purpose wheat) ) we've still ended up with over a $100 we didn't realize we were nickle and dimeing away. Talking with friends, I've found that most don't count the quickies all the time when they think about money and where it goes. Yes, the $40 they spent on a night out, or the $15 for a pizza on Friday get added into the equation - but the soda at the corner, the candybar at work, the small fry when you just HAVE to have something before dinner tend to slip people's minds. I believe it. I eat very well indeed and spend less than 3% of my income on food (<5% if you count eating out and buying wine). Less than travel, or transportation and WAY less than medical insurance for the self-employed. Finally after hearing so many people complain about the Food Industry at least someone gets it. The fact is we spend less, we have higher quality and far more choices in our food selection in our countries history. Since I have a large family, I spend a higher percent of our income on food. But I'm not about to complain. We in America still have it pretty good. My sister is doing medical missions work in a rural area of Ethiopia, and regularly sees the struggle of poverty-stricken families, trying to feed their children on tiny bits of money, money that comprises the majority of their income. Let's consider how much of the total cost of producing food is being exernalized from the price we pay at the supermarket. Corn and soy weren't subsidized (as heavily, if at all) and weren't sold as commodities in the '30s. The real cost of growing food (especially if you consider environmental costs and costs to public health) is much higher than the sticker price. So the system has changed as well as our habits. Your thesis might be more convincing if your graph didn't distort the truth. With the scale going from 24 to 8, instead of 24 to 0, your picture shows that food cost has dropped by about 90%. David: if my "numbers show otherwise," then how am I distorting the truth? Because the chart leaves out white space below the number 8? The article goes over all the numbers in explicit detail. I don't see where there's any distortion.